School of Rock is a musical based on a movie of the same name, in which Jack Black stars as a Dewey Finn: schlubby, passionate, music-obsessed dude who would rather play his electric guitar than do anything else, ever. But the rent is way, way past due. So when his nerdy ex-rocker best friend and roommate gets the call to sub immediately at a fancy private school, Finn impersonates him and take the job – for which he is spectacularly unqualified. Eventually he forms the kids into a rock band, to the eventual horror and dismay of their parents, and enters them into a Battle of the Bands. The touring production of the show hews closely to the movie, including – regrettably – Rob Coletti, who is supposed to be playing Dewey Finn, is more or less playing Jack Black playing Dewey Finn. It’s sort of a flat, two dimensional representation, not much assisted by a mediocre vocal performance – his voice just isn’t well supported and it really shows as he races around the stage, though his stand-and-sing rock voice is solid. Unfortunately there’s not a ton more depth in most of the other adult characters either. As a show, School of Rock is the live-action, rock and roll version of a Peanuts cartoon. The adults are wah wah wah, and the kids are the good part. On the other hand: holy wow, are these kids the good part. They rock out as soon as they get the chance, and their backstories are well-engaged. There’s Lawrence (Theo Mitchell-Penner) who worries about not being cool and having no friends, Mystic Inscho plays Zack, a kid with a father who never has time to listen to him, Freddy (Cameron Trueblood) struggles with a father determined that he learn to do “real work,” and Leanne Parks rips it up as Katie who owns the entire situation once someone hands her a bass guitar. Sammy Dellas plays Billy, a budding fashion designer from a “football family” whose father busts him reading Vogue behind a Sports Illustrated and hyper-competent Summer (Sami Brayas) who is 100% ready to be in charge of everything, ever. Their musical and acting talents are tremendous, to the point where there’s an Andrew Lloyd Webber recording played at the top of the show to assure all audience members that the kids sing and play their own instruments, live every night. The kid backstories in School of Rock also gave my eight-year-old and I some opportunities to talk about what it’s like to feel alienated, lonely, unheard or unwanted. It was sweet to have the jumping off point together to talk later over gummy bears. School of Rock is a fun, splashy, all-family show, and when the kids perform they’re fantastic. Do you have some children you like? Take them to this (and – fair warning – be prepared to be begged for a drum kit afterward). 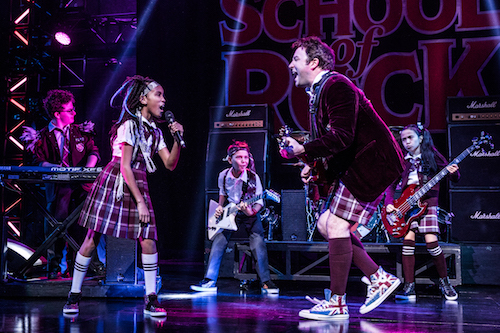 School of Rock is playing until January 6th, 2019 at Ed Mirvish Theatre (244 Victoria St, Toronto). Showtimes are 7:30 PM from Tuesday to Saturday, 1:30 PM on Wednesday, Saturday and Sunday, with additional performances Nov. 29, Dec. 27 & Jan. 3 at 1:30PM and Sun. Dec. 30 at 7:30PM. There is one captioned performance at 1:30 PM on December 16. So, I saw “School of Rock” on Thursday. I quite like this movie but any charm the movie has is lost in the musical. The main problem is the script. It rushes through the plot points to get to the musical numbers. But except for the songs that are featured in the original movie the rest are instantly forgettable. And I couldn’t understand a word anyone was saying as they screamed out all the innocuous rock lyrics. I mean, this is a musical and the songs are supposed to help tell the story. What good are they if you can’t hear the words? As for the problems with the story, well, the premise is that the kids are shy and awkward, but the first time you see them they are singing and dancing (and moving their desks) all over the place. It’s great that the kids all play their own instruments but progression from nerds to rockers is just too short to be effective. The lead tries his best to be Jack Black but again there is just not enough story verses the frantic musical numbers to get to know the guy. The only charm he or any of the other characters have is remembering what they were in the movie. Some movies do work as musicals and even exceed their originals but this ain’t one of them. I’d give it a pass!